I've not changed much in his bedroom since I designed his nursery (before and after ) but I did exchange his crib for the beautiful from (which we love) and I added a small table with a bench from along with a Bloomingville wooden toy box on wheels (not shown). I also mixed new rugs, linen curtains, new bedding, a few new cushions and I switched up the art on one of his walls. So I guess I did change a few things! It really needed a facelift and he was so happy when he saw the finished results! I imagine his room will stay this way (more or less) for another 3-4 years, and then we'll update again with new wallpaper on the back wall, new paint, new scheme... But for now, this room is definitely made to grow with him. Switch out the crib with an adaptable, quality bed. I didn't want to buy a toddler bed, then have to buy a twin bed or a full bed a few years later, too much shopping! 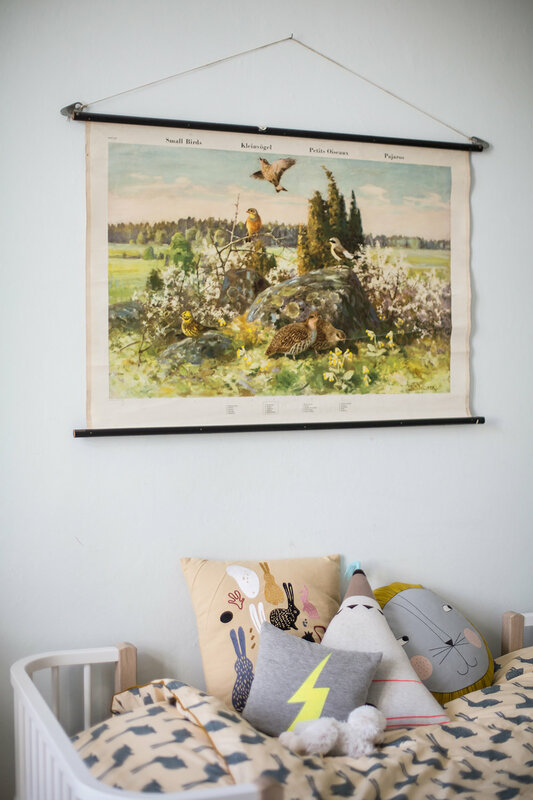 We opted for the Wood Day Bed from because it's made very well, handmade in fact, and is a beautiful Danish design so if he tires of it in a few years, it will fit beautifully into my guest bedroom where I currently have a very boring twin bed. This day bed also has an organic allergy-free mattress and an extra insert to extend the current mattress with any extra peice, so when he is taller, the day bed grows with him - the frame pulls apart and you place in two new railings. Then it's the length of a normal twin size bed. Work table - a must! A baby isn't able to sit on a bench and color but a little child loves being creative so give them space to do so in their room on a little table, mine is from . I have two benches for this table but the other one stays in the guest room with plants on it for now, but when he's friends come by and they all want to sit at the table, I can pull the second bench out and they can go at it. He also loves that he can pick up the bench and move it around his room. He likes to move it below his window so he can peek outside throughout the day. Flexible dresser/changing table top. I was THRILLED that I ordered a changing table/dresser combo from before he was born because the changing surface came off easily and now he still has the lovely white dresser that he's had for over three years now. I lost the handles though (I took them out when he was crawling and emptying out the drawers constantly) and haven't found them since so now I am looking for new pulls. But other than that, the dresser is still in beautiful condition and we really love it. He can keep this dresser for years and years, and it's wood so we can paint it black when he goes through his teen angst years or whatever. ha ha! 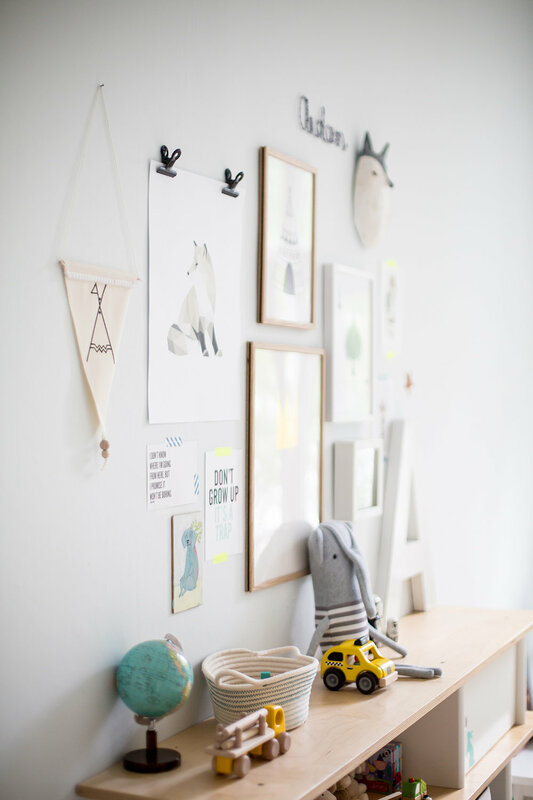 Also, you can shop more of my favorite things for kids at where I have my very own set up. I'm excited to share the big before and after reveal of how our project with * came out for the entry, which is perfect if you're looking to update your mud room or entry with a stylish storage solution. Organization doesn't have to be ugly! But first, if you don't know who Superfront is, they're a Swedish firm that specializes in designing and making gorgeous quality doors, hardware, sides, legs and tops for Metod and Besta IKEA cabinets. Everything is designed in Sweden and made there, too. They also ship their legs and handles worldwide, with the rest of their products shipping throughout Scandinavia and Europe, so there is no reason not to check them out. If you're like me, and you like IKEA but don't want your IKEA stuff to look like everyone else's, I highly suggest working with Superfront to elevate your Metod and Besta cabinetry. I'm all about customization and making something mainstream into a more personal style statement. In fact, Superfront can be seen on the pages of magazines like Elle Decoration for this very reason - people are using their products to breath new, stylish life to IKEA cabinets. You can customize your entire kitchen, office, sideboard or entry cabinet for maximum impact. Superfront has many colors to choose from, lots of different legs and a lovely selection of hardware. You can see a little glimpse above of how I pimped my Besta, but would you like to see the big before and after reveal, where I turned a depressing corner with white wood chip wallpaper and a lonely gray cabinet into a statement making entry? Okay here's the big before and after reveal below. First though, let me lay a few things straight because it's not where I want it to be yet (the decorating part). I want to install a large mirror above the cabinet to reflect light from the facing windows (that you can't see) from the adjacent dining room. That alone will REALLY brighten the entry, which has no windows (only doors leading to other rooms). I also want to add a medium-size plant to the top of the cabinet (far left) and switch out the paper and bamboo pendant light currently installed for a large gold brass light. I haven't found the perfect one yet, so I've been holding off... But the search is on. I also need a new lamp for the cabinet but I can't find the right one so this is also a work in progress. I honestly find lighting such a hard thing to buy, not because there is no selection but because there is such a massive selection and often too much choice paralyzes me. As for the cabinet, I'm 100% in love with it! It's perfect and I'll tell you why below because there is drama behind every pretty photo. In the before photo, there was a radiator on the wall that we had professionally removed since the entry doesn't require a heater - it stays warm enough in the winter. I also hated looking at the ugly thing and knew that once it was out of the picture, I could put a big unit against this wall for storage. Thing is, once we removed it, we had all of those giant metal pipes and things sticking out of the wall. We couldn't remove those, we are renters, so I was having a "moment" when I saw these 4 metal pipes sticking out of the wall. That's why I knew I had to get a cabinet that was high enough to cover them but no so precious that I wouldn't mind drilling through the back of it to fit the pipes through into the cabinet. Yeah I know, crazy stuff you don't think of until AFTER a radiator was removed. While in discussion about what to put on the wall to replace the radiator and the gray wood cabinet, we had the walls stripped and then had our Aimee Wilder wallpaper installed. Once that was up, I really started to see a cabinet on this wall that would take up nearly the entire width of it that had a little glamorous edge to it. I didn't want a sideboard that was standard sideboard size (low) because my little boy who would be constantly opening and closing the doors and grabbing our keys and things off of the top. I wanted high cabinets with high hardware so he can't reach up to open the cabinets until he's old enough to know better! And that would drive me crazy so whatever I bought needed to be safe and childproof. I also couldn't have a wall-mounted floating piece because the walls wouldn't support it since the house is 114 years old. Legs were needed, but not any kind of leg since the floors are super uneven since they are as old as the house. I know, right... So much to think about for a cabinet! Oh yeah, we desperately needed storage. This old apartment, and well homes and apartments in Germany in general, never have closets. It was the strangest thing to me when I first relocated here 6 years ago, but now I totally love it because you can decide where to put your closet by having a freestanding one. We need to store shoes, mittens, hats, scarves, handbags -- everything you need in an entry before you run outdoors. We go outside each day, we live in the city, and take our little one to the nearby forest and playgrounds. This means we were in need of storage but I didn't want my entry to look like a cluttered mess yet we genuinely use everything we keep in our entry and I wasn't going to compromise style for storage. I knew I could somehow have both. The IKEA Besta cabinet I went with has 3 units, so one for each member of our little family of 3, and 3 shelves in each though you can add more if you'd like. We decided on a white cabinet because I wanted the room to be light and bright and also didn't want to distract from the bold wallpaper. I selected the front because it goes best with the pattern of pineapple. I selected the brass handles, round, to mimic the shape of the fruit and also to pick up the gold a little. For the legs, I originally ordered the Captains legs, but they not only made the unit too tall but with the uneven floors, it kept teetering back and forth and because the walls are weak, I can't secure the cabinet to the wall. The legs were the most difficult part to finalize. In the end, we went with the because they are low, super stable and they are understated and the shape complements the pineapples and hardware on the doors. They also were the easiest to adjust to the height of the floor. Misc. items in this space: Hemp Rug is from Armadillo, Tweetable Birdcage designed by Alessandro Dubini from , Ceramic jar pineapple from , Pina Sola (in Spinx) Wallpaper by , Gray from IKEA, Shoes are Swedish Hasbeens in Natural, by Teresa Esgaio is limited edition from AUPrints and the frame is from IKEA. *This post is brought to you in collaboration with Superfront —a brand I've been personally using in my home and have tested quite thoroughly. All content, ideas, photography and words are my own.